Melt away the pounds, especially around those stubborn problem areas while mastering power-walking. Walking has been proven to be more effective than doing any sitting exercises alone. This manual trainer lets you achieve a maximum walking and light jogging speed via self powered workout, giving you the same realistic feel of walking outside without having to deal with bad weather. With no electric outlet needed and no motor to maintain, you can use the Manual Treadmill anywhere in your home. It's easy folding functionality & transportation wheels allows easy mobility. 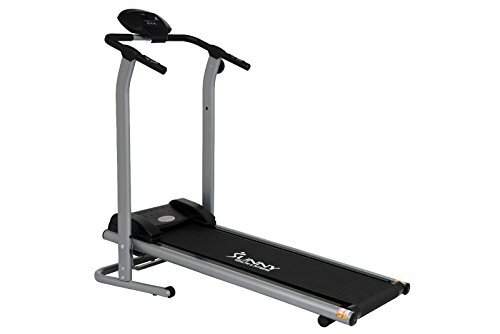 Unlike other walking manual treadmills its comes with a Magnetic Tension System (MTS) control that helps stabilize the speed of the belt and enable you to walk hands free. Running space of 41.7 x 13.4 gives you the perfect space to get a great workout. This affordable and space saving walking treadmill comes equipped with padded handrails, pulse grips and LCD monitor that tracks time, speed, distance, calories and pulse. Gives you high results without the high cost. Burn calories and save energy with the Sunny Health & Fitness SF-T7614 Adjustable Tension Magnetic Manual Treadmill.